OVER THE WINTER of 2014-15, the Utah Division of Wildlife Resources purchased the historic Big Springs Power Plant. This property is also known as the Fountain Green Hydroplant and is located adjacent to the Fountain Green Fish Hatchery. 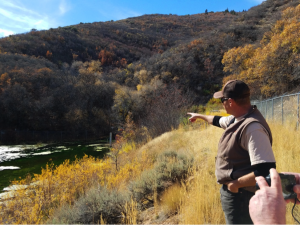 Fountain Green Fish Hatchery Supervisor Eddie Hanson showing DWR Archaeologist Monson Shaver the historic reservoir associated with the Big Springs Power Plant. Photo by Justina Parsons-Bernstein. Pacificorp decommissioned the power plant in 2014 because of increasing maintenance challenges. The parcel totals nearly an acre and includes water rights to the spring. Why did the Division buy a power plant? Though these changes will help keep disease-causing contaminants out of hatchery waters, they come at the cost of destroying a 100-year-old dam. Big Springs Power Plant and its associated structures, including an earthern dam, were listed on the National Register of Historic Places in 1989. 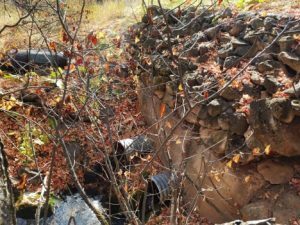 The Big Springs Power Plant Earthen Dam that was destroyed in Spring 2017 to make water security improvements for the Fountain Green Fish Hatchery. Big Springs Power Company was formed in 1902 and its power-generating operations contributed to the development and spread of electrification in Utah and the West. Because the dam is a listed historic feature, DWR had to undertake mitigation steps to compensate for its destruction. The mitigation plan proposed by the Army Corps of Engineers and agreed to by DWR Archaeologist Monson Shaver included taking photos of the structure and its demolition, conducting oral histories of former plant employees and publishing accounts of the history of the plant and DWR mitigation efforts in the Division’s blog and in an area newspaper. The complete oral interviews and a compiled history of the Big Spring Power Plant are available upon request from the Utah Division of Wildlife Resources. Great story. The Knight-Ideal community pond in Wellington is benefiting from this project. Mitigation is being done to make a wetland at the pond to replace what was lost at Fountain Green Hatchery. Thanks DWR, proud to be a partner in this project. Unfortunate to see the loss of a renewable power source. With a bit of investment this natural source could be generating electricity without any emissions for years to come. Perhaps the DWR can resolve this by allowing an organization the rights to power generation without compromising the “rights” to the water necessary for fish production. Seems obvious the two could easily coexist.